Dr Tony Adriannsen demonstrates the unique qualities of the CSIRO Haptic workbench in the training of student doctors. Networked virtual environment technology combines 3D images with an artificial sense of touch known as 'haptics' in real time, allowing students to undertake virtual operations with or without the supervision of teachers separated by enormous distances. 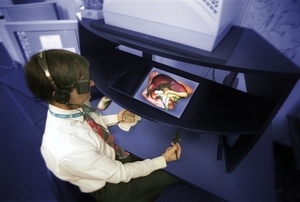 The simulated surgery uses CSIRO's haptic workbench and software - a bench sized virtual environmentthat allows the user to see, hear, feel and manipulate three-dimensional virtual objects using touch-sensitive tools. The system was demonstrated on an ultra-high speed, advanced research network developed by CeNTIE (Centre for Networking Technologies for the Information Economy).